Kika personalized leather tote bags are available in either smooth or textured, 100% Italian Nappa leather, with no minimum order amount. Your large or small personalized tote bags, handmade, are fully lined with fire-rated, luxury Suede Vision fabric. The inside pocket of this personalized leather tote is made from black leather, or alternatively printed leather, with zipper closure is a dual compartment pocket. Personalized Leather Tote for a classic night out or a special occasion. A handbag is a woman's best friend, and it can totally change the look and feel of a single outfit. Add a touch of color and personality to your look with a personalized leather tote. Handmade to order and available in a choice of two different sizes and two different finishes, the design of our personalized leather tote is truly down to you. Both size bags have strong, leather handles which are 16.53" long, with an 8.27" to the top edge of the bag. You Kika personalized leather tote bags are made on site in our studio, with no minimum order amount. A printing technician will print your design using the most up to date printing methods. This technique has been developed solely for leather printing and ensures a permanent print. This makes your photos and memories as strong as the leather itself. Our craftsmen will then cut your bag to shape before seamstresses stitch it all together for you. The printing method we use makes your personalized leather tote design as strong as the leather that it is printed on. We use beautiful Italian Nappa goat leather to make your personalized leather bags, and as with all high-end leather products, the print can lift if you scuff the leather. This is most apparent in corners and along the bottom, and we advise that you take extra care with your personalized leather tote handbag to keep it looking as good as new. 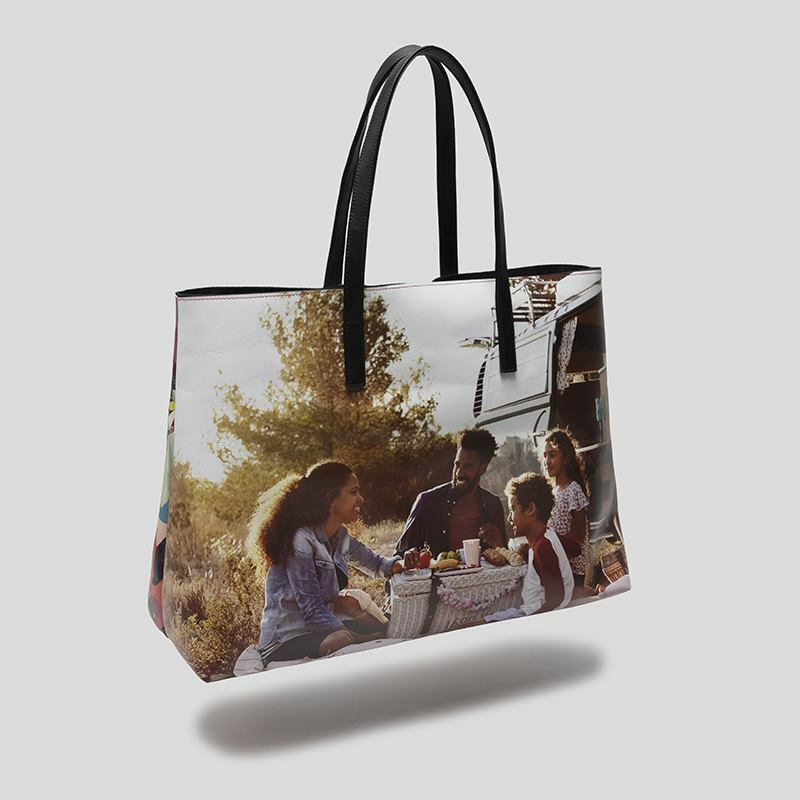 There are so many things that you can do with your personalized leather tote bags, that the possibilities are almost limitless. Design in neutral tones to have a chic, sophisticated piece, or go bold and beautiful and make a statement. A personalized tote is a fantastic way to finish a specific look, and due to the versatility of it, from formal wear to daywear, we couldn't do anything but recommend this one. Leather coin purse in the shape of a shell, with a vegan-friendly option. Personalize with your photos and memories.